Caroline Stevermer's birthday is today. I really enjoyed her novels, both solo and in collaboration with Patricia Wrede, and I regret that we haven't seen anything in a decade or so (save one short story.) So here's a repost of what I wrote about two of her novels, A Scholar of Magics (2004) and, more briefly, When the King Comes Home (2000). Caroline Stevermer's A Scholar of Magics is another fairly direct sequel that still can be read independently. It is a successor to A College of Magics (1994). 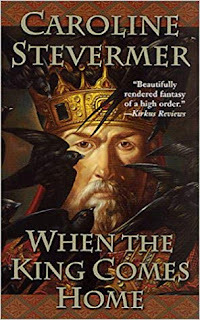 (Both books are apparently set in the same world as her intervening novel When the King Comes Home, but that novel is set much earlier and I for one cannot readily detect the correspondences.) A College of Magics was set at Greenlaw, a Women's College in what seemed to be a version of France in the early 20th Century, and it involved Faris Nallaneen and her assumption of the important post of Warden of the North. 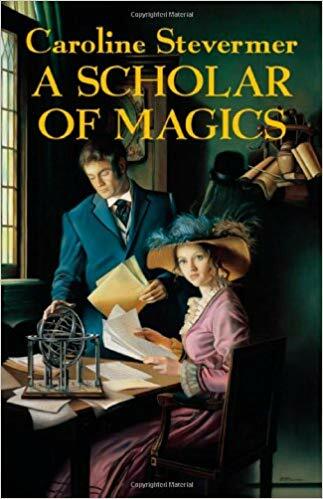 A Scholar of Magics is set at Glasscastle, a Men's College in a version of early 20th Century England (probably around 1915 or so), and it involves a man assuming the important post of Warden of the West. A major character is Jane Brailsford, a teacher at Greenlaw and a close friend of Faris. The central character, however, is Samuel Lambert, an American sharpshooter who has been engaged by a group at Glasscastle which is researching a new weapon. Lambert's shooting ability will help them refine the aiming mechanism of the weapon, apparently. Lambert is friendly with Robert Brailsford, a Fellow at Glasscastle and Jane's brother. Jane comes visiting her brother, but she has an ulterior motive. Faris has sent her to track down Nicholas Fell, another Fellow of Glasscastle, who is supposed to become the new Warden of the West. But Fell is resisting. It's a very engaging, very fun, novel. The characters are likeable, believable, and unexpected in some ways. The love story is very understated, to good effect. The magic is interesting and nicely handled. The pace is a bit leisurely, but the book remains involving, even through an oddly extended denouement. 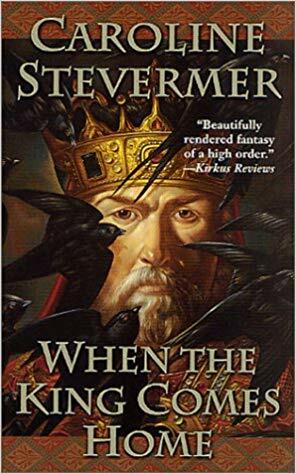 My favorite Stevermer novel so far. Caroline Stevermer has a new book out, When the King Comes Home. It's apparently set in the same world as her fine earlier book A College of Magics. It's been a while since I read the earlier book, and I confess I didn't notice any close links: I'm pretty sure both books can be read independently. This new one is quite a nice book. The world it's set in is very much like roughly 16th Century Europe. It's set in an imaginary country in Europe, and the other fantasy element is that magic works, though magic isn't wildly prevalent. Mostly, the feel of the setting is like our world. The narrator, Hail Rosamer, is a young apprentice to a successful artist. She lives in the capital city of their "country", which is ruled by an old, dying, King, and a capable "Prince-Bishop". But people remember the days of Good King Julian, 2 centuries before, with great affection. It is said "When the King Comes Home", any number of miracles might happen.